Céad míle fáilte/Welcome. I'm Trish, an Irish dedicated follower of fiction! This site is my place to share book reviews and geek out about all things bookish. * This is a spoiler free zone so you can read without fear. * I love all sorts of books so there will be a mixed bag of reviews on here. * Check the features tab for the lowdown on other fun/nerdy stuff that happens around here! Like what you see? Well, great! Why not get future posts by email? Oh and you get my free pdf download - NOTE TO BOOK - so you can record all your own bookish thoughts! SEARCH FOR WHAT YOU WANT! Twitteresque Reviews: 3 Contemporary Books reviewed in 140 characters or less! 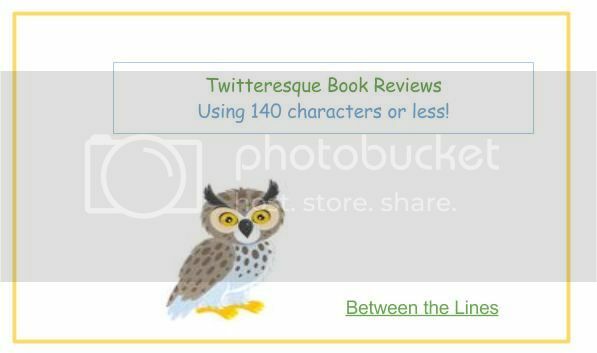 Twitteresque Reviews: 4 Books reviewed in 140 characters or less! Twitteresque Reviews: 4 Books I loved, reviewed in 140 characters or less! When you buy a book from a purchase link you show support for my blog and I receive a small kickback. All proceeds go towards hosting this blog and holding giveaways. Thank you! Thanks for calling, I hope you found something of interest. Don't be a stranger! And if you have left a comment, thank you. Comments make my day and I aim to read and reply (eventually!) to every single one. Copyright © 2019 Between My Lines. Tweak Me theme by Nose Graze. Design by The Lovely Design Co. and Customized by These Paper Hearts.